Involved with martial arts since 1977. Background includes Shaolin, Kenpo, 8-Step Praying Mantis, Shuai jiao, Yang tai chi, Ba Gua, Xing I, BJJ, MMA, Kali, American boxing. Yes, Lou, “out with hand”, refers to the hand “leads”, there is no power on the hand. The hand specifically refers to the middle finger leading. The power is on the rear foot, pushing. This pushing action is 45 degrees back and downward. 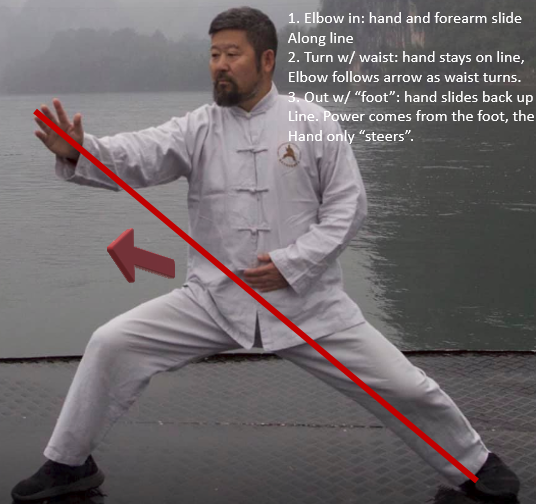 What comes to the front hand is the reaction of the foot pushing backwards.